Welcome to what we hope will become another series here on the blog, in addition to our Where We’ve Travelled series. Poopsie’s Adventures in DIY will chronicle exactly that, Poopsie doing some DIY around the house. Technically we could classify his cheese articles under DIY, but this series will mainly chronicle how we insource instead of outsource, and hopefully provide you with some inspiration to do the same! 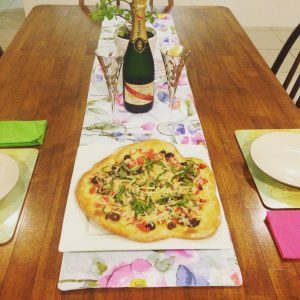 Excuse the pizza… our dining room table before. 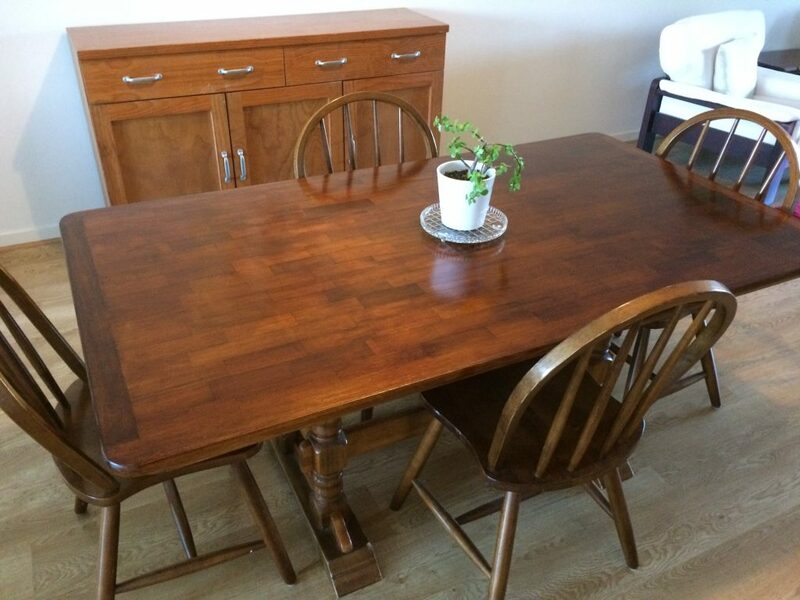 Like a lot of furniture in our house, the dining table is second hand. 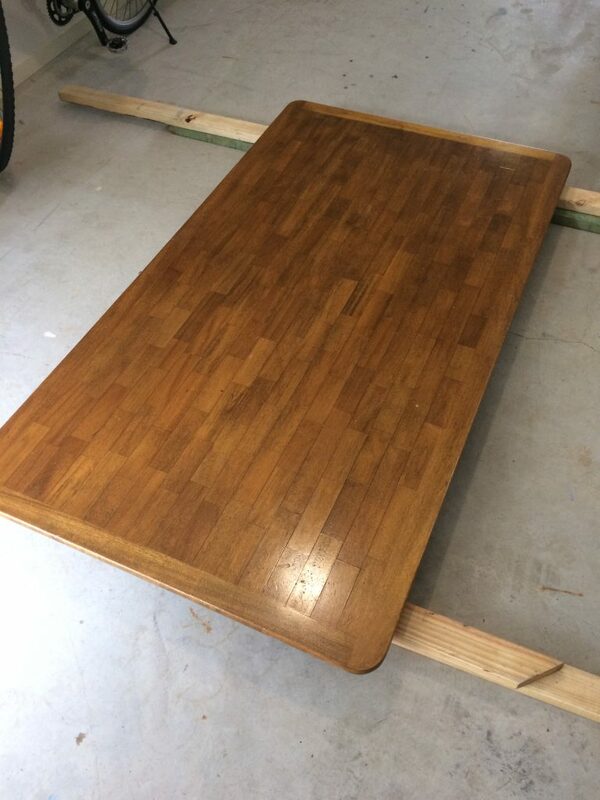 It’s a good and solid pine table that has a subway pattern parquetry on the top. The previous owners had young children, so there were some permanent marker and crayon stains on it, and it was getting a bit sticky. I decided it was time for a new finish. 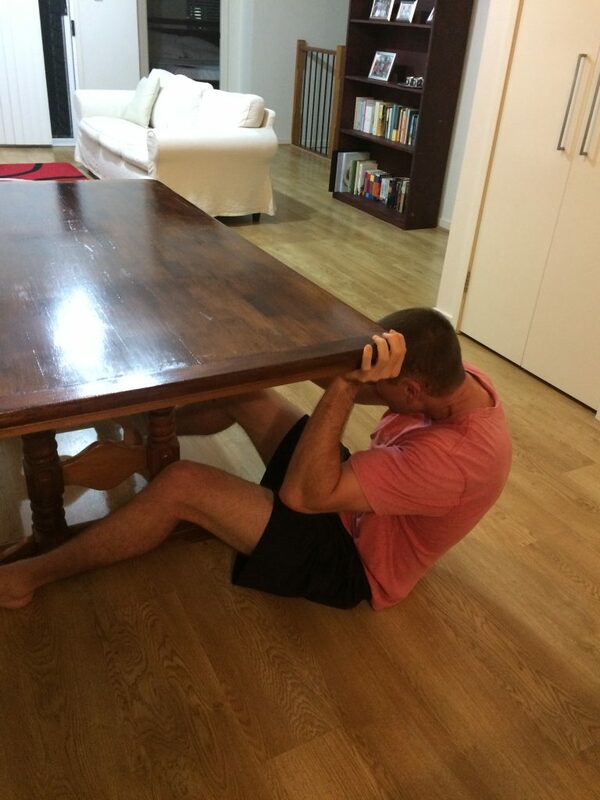 On mentioning this to a friend, their genuine response was “Wouldn’t it be easier just to get a new table?”. Now please indulge me in a rant that I get on fairly regularly – the art of insourcing jobs around the house. All the great frugalistas, like Mr Money Mustache and the Frugalwoods, talk about insourcing and how much it can save. I for one am innately curious, so any opportunity I have to pull something apart and mess around with it I jump at. I also very much enjoy the sense of caveman accomplishment that comes from ‘doing it yourself’. 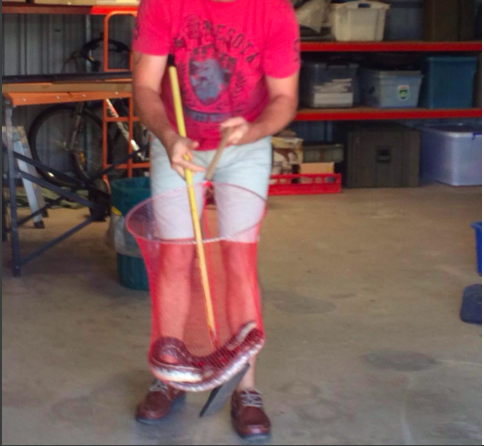 The ultimate caveman experience… DIY-ing snake removal from my father-in-law’s shed. It’s a generational thing. I remember my father building a garage next to our house like it was no big deal, him and I rebuilt (disassembled, fixed, panel beat and repainted) the back end of my teenage car when I had a bingle and he currently has a completely disassembled car in his garage that he’s slowly putting back together. He did EVERYTHING around the house and the car. The only other tradies I saw were electricians coming in to sign off and check his work. 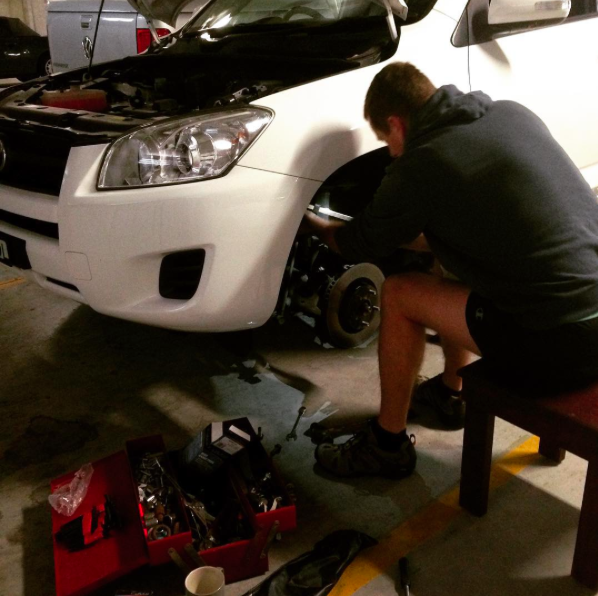 Changing the brake pads on our old RAV-4. Now, I think I’m pretty handy, but I still default to my Dad for advice before I tackle something big and I will give anything a go. But I notice less and less of this happening. We have friends that wouldn’t dream of restaining a tabletop, or changing brake pads in a car – they’re much more comfortable throwing money at the problem. I probably should have sourced some saw horses before commencing this task. After working out that I could take the top off (and hence not get a hernia taking the whole thing downstairs) I relocated to the garage. I borrowed a belt sander from my father-in-law and set to work bringing the top back to bare wood and smoothed out some unevenness on the inlay at the same time – total time 2 hours (and about a litre of sweat). 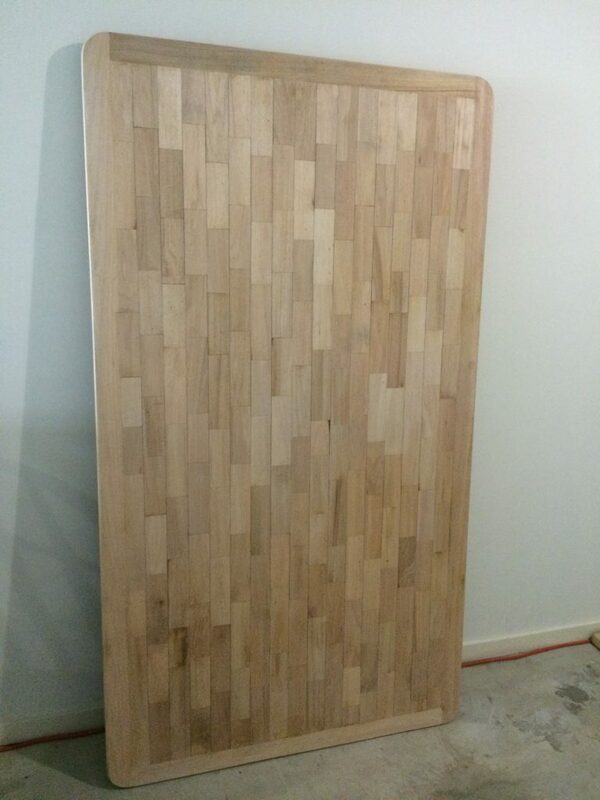 The table top sanded back to wood. At that point I knew what I had to work with, so I went up to my local big box hardware store and got my supplies: combination stain and varnish, wood filler, sanding paper and turpentine*. Surprisingly the wood filling took ages as I found a lot more gaps than I’d initially thought, so that took another 1 hour to completely fill. I then had to re-sand the table to get all the excess putty off and clean the dust off with a damp rag. 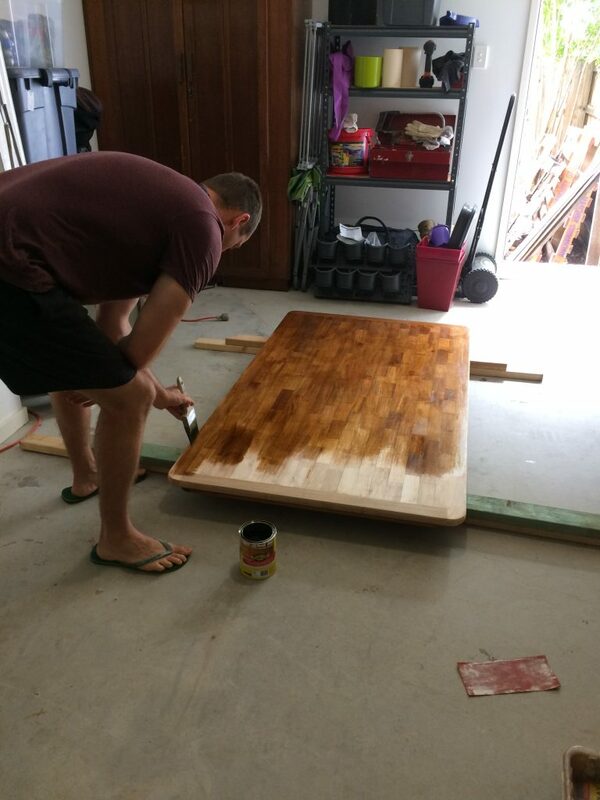 Then it was go time – stain on wood…..I always get nervous when I start the actual painting! Sanding and the first coat of varnish took me about 1 and a half hours. 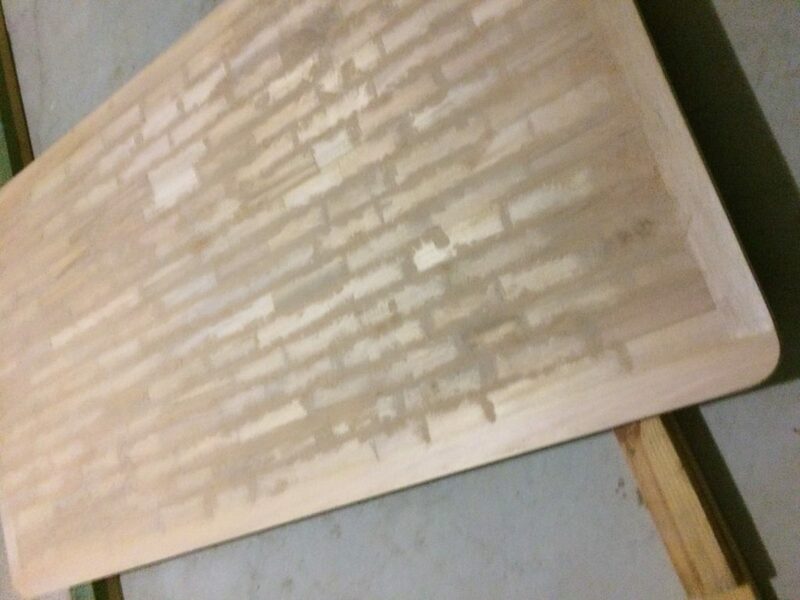 A light sand on the dry varnish with fine paper and second coat on – half an hour. I can’t believe I didn’t think to borrow some saw horses! Rinse and repeat day 2 – another half an hour. I did a last check of the finish and it looked great. I humped the top back upstairs and screwed it all back together. Securing the tabletop back onto the base. Some tips and hints about the process. Do this job in a low wind area. Varnish remains quite sticky for a few hours, so any dust and bugs will get stuck to it. Invest the time in surface preparation. A lazy sanding job will be a whole lot more evident once the stain goes on. Do use the expertise of the hardware store sales staff and your Dad. * As a result of my parents being retired house painters, I never need to buy another paint brush, putty knife or roller again in my life, so that was a bonus. But a medium quality brush for this job would have only set me back $15 tops. Have you got any DIY stories to share? Is this something you’d like us to continue sharing on the blog? Let us know in the comments below! My dad is like your dad, and even at 70 he is still painting and sawing and running cables and pulling things apart to put back together. Unfortunately, although I always like to pull things apart and see how they work, blood/sweat/tears DIY isn’t my forte. Quite frankly, we are lazy and we’ve never taken the time to develop the skills. 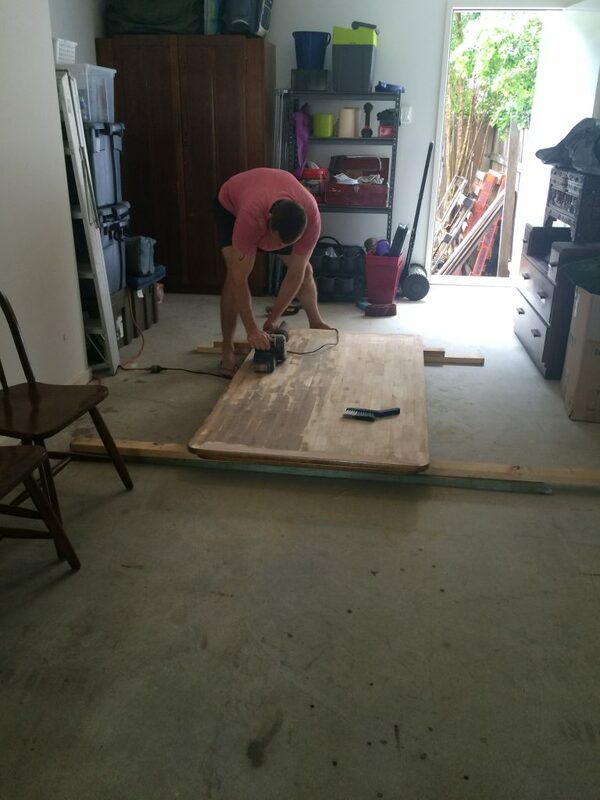 Even when we try to DIY, we tend not to finish anything. My philosophy most of our lives has been that we are better off hiring someone for big jobs, because they can do it in a fraction of the time and it will actually get finished. Small jobs I just live with until they break and we are forced to do something (I know, this is bad). Please keep doing posts like these. The more I see that other people can do it, the more it might sink in that this is something we can actually try. It was always a bit of a joke at my house that whenever I fixed something there’d always be a bag of ‘bits’ leftover. Which (if the item was working) got put in a bag in a drawer in case it was needed later. I tackled the volume buttons on an iPhone 5 a while ago, and I literally had to pull it apart and put it back together 4 times before I got it right (or didn’t have any parts leftover). So take heart, the sense of accomplishment is worth it (as is the cash savings, new skills and sense of superiority to common folk). Plus – Youtube has a video for EVERYTHING! That snake shot is insane! I know right! I definitely kept my distance!